For sport specific details such as eligiblity, entry and game change deadlines please see that sports dedicated page. We look forward to sharing your success story in our upcoming ROPSSAA Newsletter. Kindly email your success story with a team photo to namita.sawh@peelsb.com for consideration. Deadline Date: March 29, 2019. Submit your Illustrious Alumni to add to ROPSSAA’s Alumni List! The ROPSSAA Team would like to begin gathering names of former exceptional ROPSSAA student athletes who moved on to play sports at a higher level which include University, College, International or Professional Competition. An Alumni list will be created to share on our website! If you are aware of any such alumni, then kindly submit the following information to: namita.sawh@peelsb.com. Where student is currently playing or played. New Coach Profile Segment for ROPSSAA’s Seasonal Newsletter: Submit your profile! The ROPSSAA Team would like to raise awareness of time and energy coaches give to ROPSSAA. Share a little about yourself and your coaching style through our newsletter! Profile must include sports coached, school involvement, community involvement etc. Finish off with what or who inspired you to begin coaching and why you continue to do so. ROPSSAA hopes to feature two coach profiles per newsletter. Kindly submit your coach profile to Namita Sawh at namita.sawh@peelsb.com. Ability to report scores, highlight high scorers and provide summary of the game. Reminder emails will be sent to Athletic Contacts if scores are not reported by midnight the day of the game. Post game sheets to the website immediately from your mobile device or scan the game sheet at your school and upload a PDF. Game sheets will be viewable by anybody with a login for the website. Chose to automatically have your game score posted to the @ROPSSAA Twitter account! 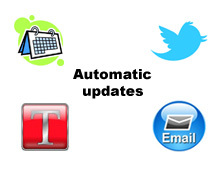 Automatic Updates – Stay Connected! Register to follow one team, one school, one sport, or any combination of schools and sports and have an email automatically sent to keep you up to date! Receive immediate confirmation of submitted forms for your records!